The U.S. and Japan have very different memories of World War II. A file photo dated September 1945 of the Prefectural Industry Promotion Building’s remains after the bombing of Hiroshima, later preserved as the Hiroshima Peace Memorial. On Tuesday, President Obama announced his decision to visit Hiroshima, Japan, the site where the U.S. dropped an atomic bomb in August 1945. Obama will specifically visit Memorial Park, which commemorates the event; he will be the first sitting American president to do so, although he does not plan to offer any sort of apology. The bombing of Hiroshima killed around 100,000 people; three days later, tens of thousands more were killed after the United States bombed Nagasaki. To discuss the issues of war and memory, I spoke by phone with Carol Gluck, a professor of Japanese history at Columbia University. We talked about the ways in which the American and Japanese narratives of the war have changed over time, how nationalism has shaped the memory of World War II, and why Obama’s decision to visit is symbolically important. The conversation has been edited and condensed. Isaac Chotiner: What did you make of President Obama’s decision to visit Memorial Park? Carol Gluck: I think it is a very good decision. I think it is a decision that probably would have made sense to do earlier, but it makes particular sense to do in the context of President Obama’s anti-nuclear policies. It also makes sense in terms of the alliance between Japan and the United States. I think the question is why it took 71 years for this to happen. And I think there are answers to that. The first reason is that the atomic bomb narrative is extremely strong in every country I have studied. It is one of the few aspects or parts of the story of the Second World War that haven’t changed, while other parts have. The countries’ national nuclear narratives are very much locked in place. The Japanese national narrative is that the bomb gave Japan a mission for peace in the world. The bomb doesn’t end the war: It starts the postwar mission for peace. The American narrative is that the bomb ended the war and saved American lives. That’s the story. The second reason is that the politics of apology have gained more emphasis since the end of the Cold War. That’s interesting because the critique some people make is that Japan’s understanding of the war hasn’t changed at all, on any front, and that the country still sees itself as a victim rather than an aggressor. It has a victim narrative, but that is true with every country, including Germany, which saw itself as a victim of its leaders. But Japanese victims’ narratives lasted a lot longer than others. There are several reasons for that, but probably the most important was the United States, which conspired in creating that narrative in the first few months after the American occupation. To achieve the goals of the American occupation, it was important to see the Japanese aggression and atrocities as something that was brought about by bad leaders, so that these leaders—but not the people—were held responsible. That was a good grounding for reforms. This narrative sat well with the Japanese but it was a co-created narrative. Do you think the larger Japanese narrative has changed? Yes, yes. That is what I am trying to argue. The bomb story hasn’t changed but the country has changed since 1989. When Hirohito died in 1989, the same year the Cold War ended, the United States stopped being the only country that mattered to Japan. The country was [suddenly] facing Asia, and so you got the rise of issues like the comfort women and biological war crimes. [Japan exploited a vast number of sexual slaves—so-called “comfort women”—from the countries in Asia that it occupied.] These things, according to Japanese opinion polls, have had a tremendous impact on the Japanese public. That is why there is a conservative backlash. If you look at polls about the comfort women, the Japanese people think the comfort women should be compensated. You have to separate out the Japanese public from the right-wing politicians. Sadly, one of those politicians is the prime minster, who has visited a shrine that includes war criminals and appointed people to government positions who take a reactionary line on World War II. Not only sadly, but loudly. It isn’t just Prime Minister Abe. This nationalistic, conservative leadership that uses the rewriting of history to bolster its regime is something we see now with Putin, Xi, Erdogan, Modi, and in Poland and Hungary. We may start seeing it here after November. Well, I don’t think it will change our narrative of WWII. [Laughs.] It may change other things. But my point is that the larger story has changed but the bomb story hasn’t changed. Here, I don’t think the story has changed but the attitude is changing. The people who fought in WWII will not change their narrative. They tried to put it on a postage stamp saying, “Atomic Bomb Hastened War’s End.” But then you have future generations that are not all the same. In Hiroshima they start with the bomb, although now they acknowledge there was a war that ended with the bomb. But the Americans end the bomb story in 1945, and what wasn’t acknowledged was the arms race and radiation sickness. This was the subject of the Enola Gay controversy at the Smithsonian in 1995, where veterans did not want to acknowledge radiation sickness. 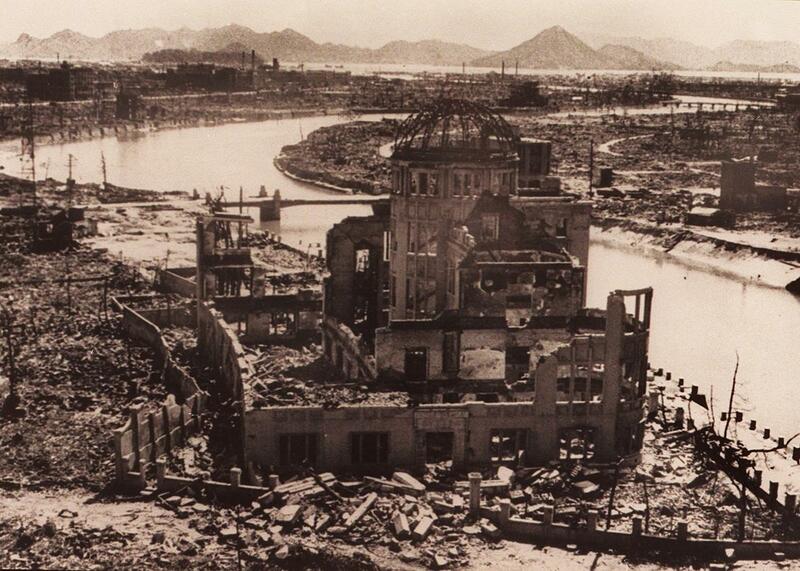 The Japanese ignore everything before Hiroshima and the Americans ignore everything after Nagasaki. Both of the stories are truncated. There is one other point. The atomic bombings were a continuation of civilian bombing, area bombing, carpet bombing, that every country did in World War II. It was universal. So if we are talking about the lessons of Hiroshima, we need to talk about the lessons of civilian bombings generally. I was just about to ask what lesson you thought people in both countries should end up taking away from the visit. It is not going to be this! What I am arguing is that these bombs are often singled out but they are a subset. It is a new gadget to do the same horrific thing. It is not going to come up. This is what I mean about the bomb narrative being so solid. But I think the main thing of the visit—like most things involving the politics of memory—is symbolic. It is a symbolic gesture. It says, “We don’t believe nuclear war is right and we don’t want to see it ever again.” That’s what the banner in Hiroshima says: “We shall not repeat this evil.” The New York Times asked what everyone else does: Does this refer to the bomb or the war? Yes, there is an ambiguity there. Actually it means both. And so that’s what Obama is saying with his visit. We are saying that this sort of suffering is terrible, and that’s good. Instead of having a huge military parade, which have gotten bigger and bigger in Moscow and Beijing, this is another way of talking about the war.